POP the BUBBLES! With just a few simple supplies, kids can create fun bubble popping games that will encourage learning about letters, numbers, and shapes through sensory play. If your kids haven’t tried Wikki Stix with bubble wrap, it’s “popping FUN” for playful learning games. First, invert the bubble wrap so that the bubbles are not facing upward. Invite kids to create any uppercase or lowercase letters they know with Wikki Stix. Place the Wikki Stix created letters on the backside of large bubble wrap (one letter per each bubble). 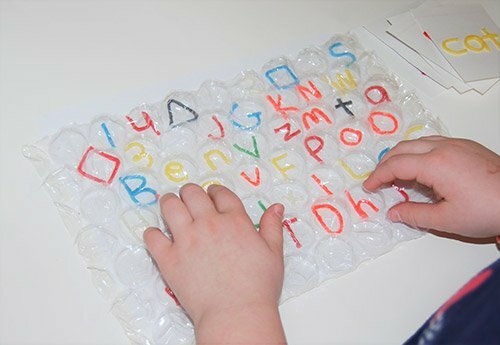 Place a plain sheet of white paper on top of the Wikki Stix-created letters and flip the bubble wrap right-side up. Adults (or peers) can then call out any letter underneath the bubble wrap. Kids have to locate the letter(s) and pop the corresponding bubble. To make the game more challenging, invite kids to say the corresponding letter sound as they locate and pop the individual bubbles. Extension activity: Brainstorm various items the kids could use to pop the bubbles besides their own fingers (examples: a play hammer, kid’s tweezers, a child-sized fork or other items to encourage fine motor strength). 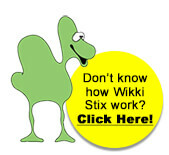 Create a hands-on learning center: make individual letters, names, or beginning words on index cards with Wikki Stix. 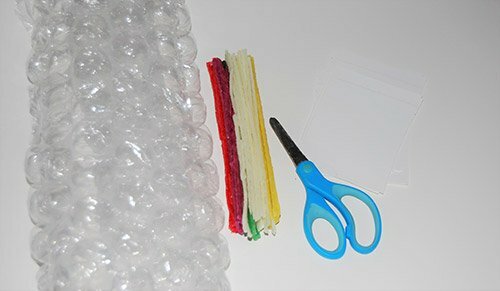 Kids can then create Wikki Stix letters that correspond to the letters, names, or words on the cards, and place the Wikki Stix letters on the backside of the bubble wrap. Again, place a plain sheet of white paper over the created letters and flip the bubble wrap right-side up. Kids can then choose one card at a time and pop the bubble(s) with the corresponding letters in the order they appear on the card(s). Make a small group game: kids can work together to create Wikki Stix letters to put on the underneath side of the bubble wrap. 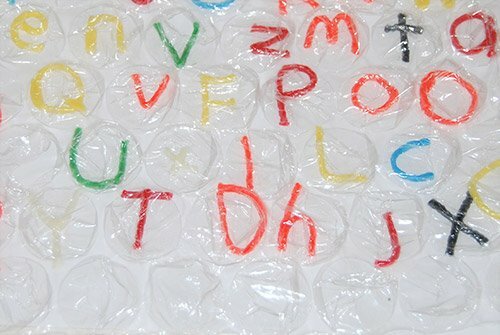 Place a plain sheet of white paper over the Wikki Stix letters and flip the bubble wrap right-side up. Designate one player to call out items in the room. Players take turns popping the bubble with the letter that corresponds to the BEGINNING letter of the item called out. If a player misses the correct beginning letter (or that letter is not available), the bubble wrap passes to the player on the right and a different item is called out. Play continues until all the bubbles have been popped. 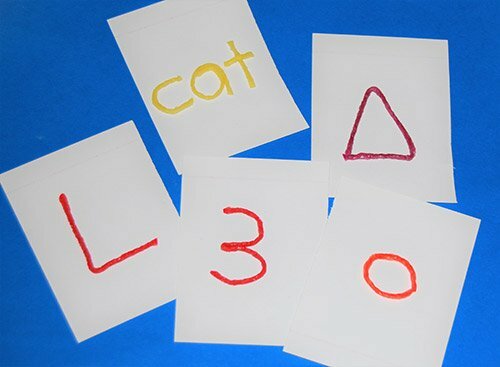 Kids can also create Wikki Stix numbers or shapes on index cards and then make corresponding numbers and shapes to place on the bubble wrap mats. Kids should randomly choose a card, locate the number or shape on the bubble mat, and then pop the corresponding bubble. Older kids may wish to locate two numbers and perform an operation: addition, subtraction, or multiplication after popping two individual bubbles. To encourage shapes identification, as kids locate and pop the bubbles containing shapes, invite kids to count the number of sides the individual shape contains (for example: a triangle has 3 sides, a square has four sides, a hexagon has six sides, and so forth). 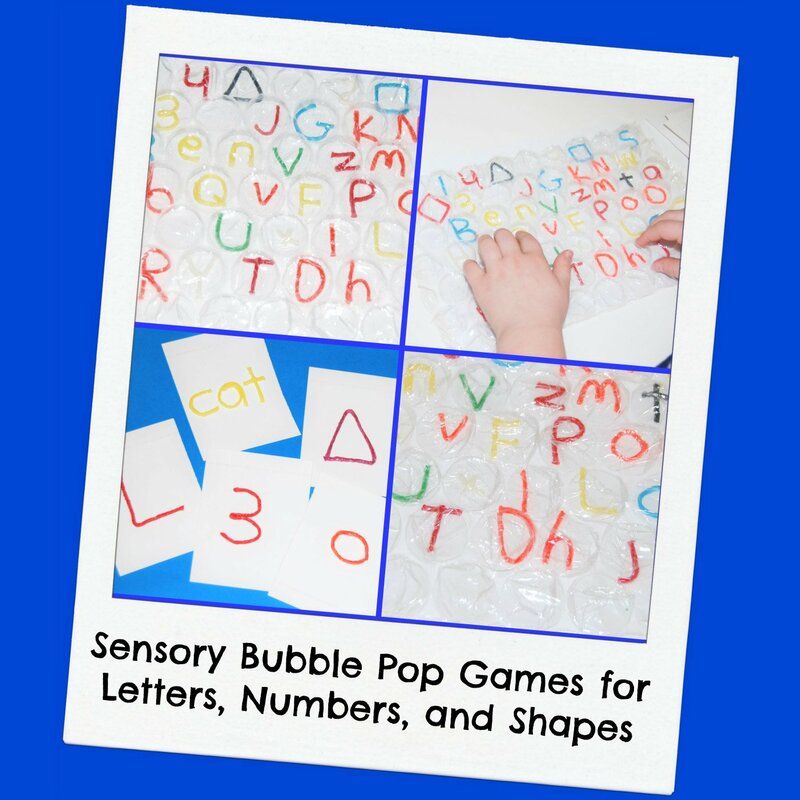 When all the bubbles are popped for any of the learning games above, encourage kids to feel through the plastic of the popped bubble and trace the Wikki Stix letters, numbers, or shapes with a finger. Tactile reinforcement is important to learning. Save the popped bubble mats for kids to practice tracing the Wikki Stix letters, numbers, and shapes with a finger. Kids might also try closing their eyes, tracing the Wikki Stix shape under the popped bubble with a finger, and then determining what shape, number, or letter it is by touch alone. The Wikki Stix Bubble Popping games are a great way to really engage kids in hands-on learning with letters, numbers, and shapes whether at home or in the classroom!